There are a few people in my life who are the source of some of my most favorite recipes and tips. My sister-in-law Cora definitely tops the list, but so does my friend Lindsay. Lindsay used to be my neighbor…those were the good old days. She’d call and say, “I’m making this awesome recipe” and I’d go over with my camera, take pictures, eat her food and get awesome recipes. Alas she lives in Seattle now, but I still use her recipes regularly. One of my most favorite recipes of all time comes from Lindsay and her husband Aaron (one of the few male commenters here on the blog! ): Aaron and Lindsay’s Chicken Tortilla Soup Extravaganza! Please note: Lindsay fries up her own tortilla strips. Because she’s fancy like that. I am not fancy and always either buy tortilla strip salad toppers in the produce section or just break up tortilla chips on top. It tastes mighty fine even with that shortcut. Promise. Have fun making and eating this soup. And be sure to bookmark the recipe, I promise you’ll be back for more. A little spicy and a lot delicious! In a large pot, heat olive oil over medium heat for a few minutes. Add chopped onion and cook until onions soften and become translucent, 3-5 minutes or so. Add garlic, green onions, cayenne pepper, chili powder and cumin. Sauté until fragrant, 1-2 minutes. Add chicken broth and bring to a boil. Once boiling, lower heat to medium low (or the lowest heat that maintains a simmer). Add tomatoes, corn and black beans and simmer for 5-10 minutes. The very best way to prepare the chicken is to sprinkle the raw chicken breast with some cayenne pepper, chili powder, garlic powder, salt and pepper and then grill the chicken. However, you can cook the chicken whatever way works for you. Once chicken is cooked, chop or shred the chicken. If you cooked the chicken another way besides seasoning and then grilling, go ahead and sprinkle those same spices over the cooked chicken to add a bit of flavor. Add the prepared chicken, juice from one of the limes and one handful of the chopped cilantro to the soup. Heat through for a few minutes and then serve! Heat canola or vegetable oil in a large fry pan over medium-high heat. Alternatively you can spry the pan with cooking spray. 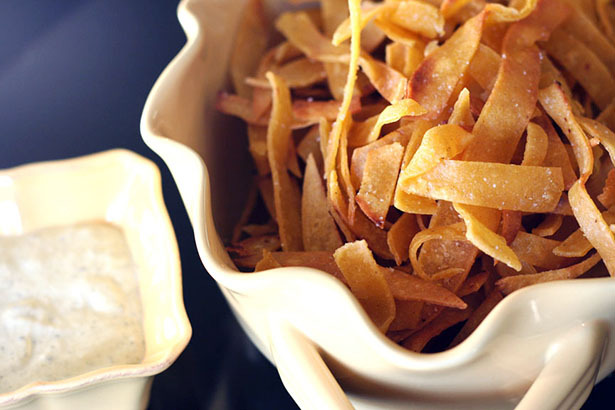 Add tortilla strips to pan and cook until crisp, turning strips every few minutes. Once browned and crisp remove from heat and sprinkle with salt. 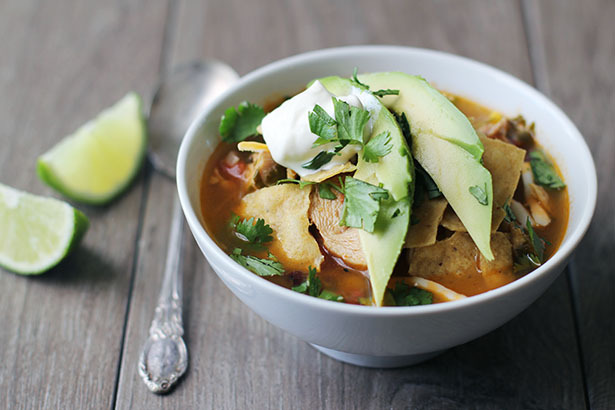 Serve soup garnished with avocado, cheese, sour cream, fresh lime and cilantro, and tortilla strips. I’m going to make that this weekend. Looks awesome! what an ingenious recipe. pure brilliance. Looks delicious – the pictures are amazing! i also miss those afternoons of having someone to chat with while i cooked. at least my toddler speaks in sentences now, but it’s not the same, jane! my favorite photo is the one of me about to cut my fingers as i chop the tomato. i’ve since then trained myself to tuck my fingers in. (it was an accident waiting to happen). by the way, when fresh corn is in season, it makes this soup extra good. just cut it off the cob and let it cook in the soup a little bit. it adds such a nice touch of crunch that frozen corn can’t do. this type of soup is my personal favorite. I love saving different versions of it. Thanks for adding in another to my collection. That looks delicious! And, as always, your photos are stunning! Great pictures, it looks very good and yummy. I’ll try it as soon as possible. New to the site and think I’ll be here more often–looks scrumptuous! P.S.–What kind of tortillas are used to make the tortilla strips? I was recently looking for a bag of those everywhere–and if I knew how to just make my own!! Thanks! I made this soup today and everybody loved it. It’s like a fajita, but then the soup version. Smells great, looks superb and super healthy. Thank you. Just made this and it was a hit! So tasty. 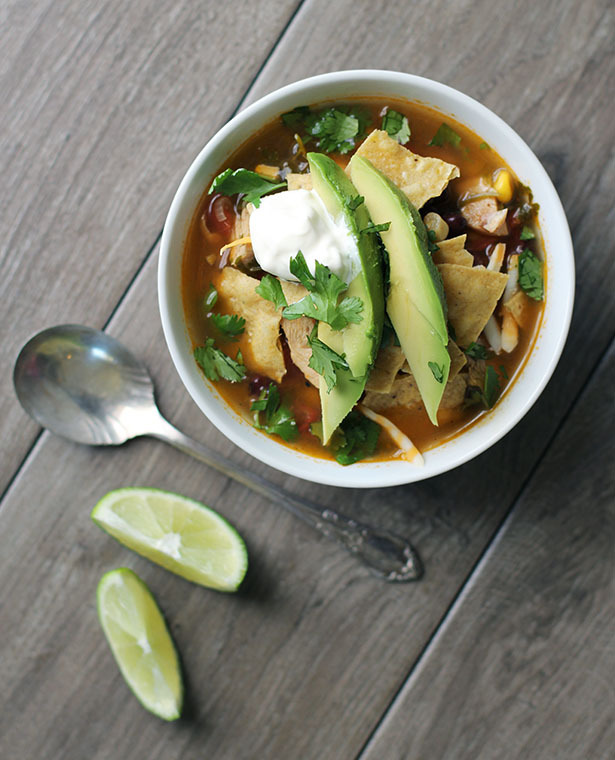 Oh this looks so good and so easy…my hubby isn’t much of a soup person, but loves Mexican food so I will give this a try! Many thanks for this recipe! My husband and I both agreed that it was the best dish we’ve ever made at home! I only made one change, red pepper flakes instead of cayenne (only because I forgot to get it at the store). Perfect kick and plenty filling! Thank you! I made this and it was great! Thanks! Just tried this- so easy and so good!!! Love your blog! 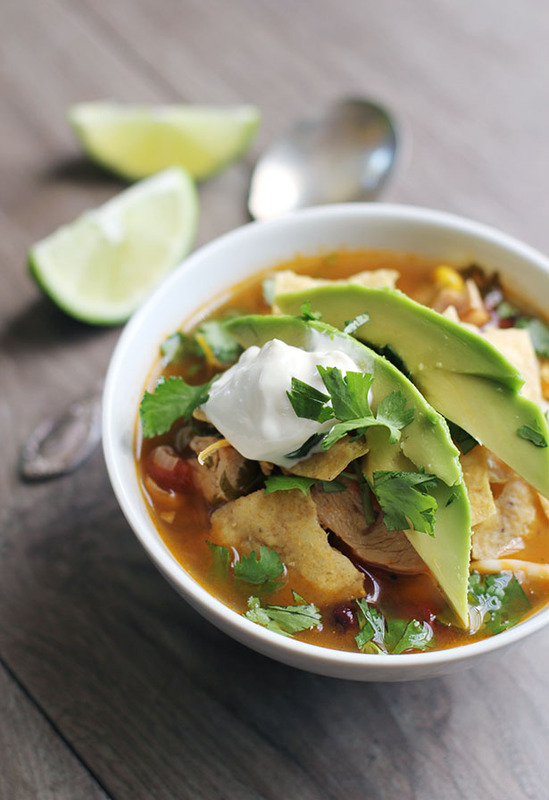 Love chicken tortilla soup! Try using a rotesserie chicken..gives this soup a deeper flavor! if you take out the chicken it is sill JUST AS DELICIOUS!!! AWESOME. thanks so much for letting us know! 🙂 so glad you liked it!